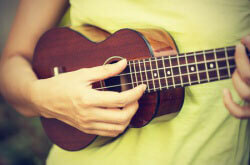 What passes as affordable when it comes to ukuleles is simply impossible to find elsewhere. However, there is one category of ukuleles that is even cheaper than that. We are talking about the most basic, dirt cheap models which are primarily designed with beginners in mind. Some of the biggest names in the business don’t even bother with this category. This is perfectly normal as they have a very different user base that insists on quality over quantity. Even though you probably won’t find an extremely cheap Kanilea anytime soon, this vacuum has left enough room for a number of budget oriented uke brands to jump in. One such brand is Diamond Head. The range of their ukuleles rarely reaches higher than intermediate level. However, without them, we would have much fewer beginner players out there and those. One model that really sticks out for a number of reasons is the Diamond Head DU-150. Now, this uke is on the lower edge of the entry level segment. While it is incredibly cheap, the item also brings a very specific set of features that depict its low price. Today we are going to give you a quick rundown of this uke, talk about its performance and see whether or not it is worth your time. With that said, let’s get started. Why Diamond Head and Why DU-150? 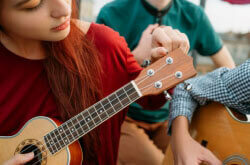 Those looking to get into ukuleles can usually be divided into two categories. First one is made of people who know this is something they will want to do long term. The other consists of people who are simply not sure. For someone in the latter group, committing to an expensive instrument simply doesn’t make sense. They won’t be able to appreciate the difference in tone which is a result of better and more expensive components, due to their lack of experience. The best option for this type of beginner is to get a cheap model that works. The one we are looking at today fits that description perfectly. 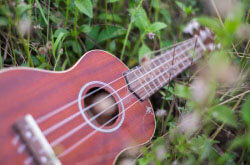 It brings that extremely affordable price, but also a performance that makes it a proper ukulele. With that said, it’s necessary to understand that models such as this one are completely devoid of any details or aesthetic features. You get a plain ukulele that serves one function and one function alone. It just so happens that Diamond Head DU-150 comes in as one of the best ukes in this segment of the market. Let’s take a closer look. Just taking one glance at DU-150 will be enough to realize why it stands out from its immediate competition. Unlike most of its competitors, DU-150 features a standard soprano shape and size. It is not uncommon that you will run into ukes in this price range that look way too much like a toy. Not Diamond Head DU-150, though. Now, when it comes to their choice of wood, we are seeing the first compromise necessary to keep the price down. Everything on Diamond Head DU-150 is made of maple. That means the body, the neck, fretboard as well as the bridge. Maple is definitely not a tree you see being used in top tier ukuleles. Its tonal properties make it a decent choice for guitars, but not necessarily for ukuleles. Even so, the full maple construction does a decent enough of a job to be classified as satisfactory. The entire body of the guitar is stained with a dark finish which makes it look like a mahogany piece. On a similar note, the fretboard and bridge feature a much darker stain, mimicking the texture and color of rosewood. 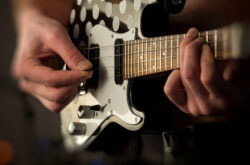 The neck features a standard 12-fret, 13.625-inch scale with nickel silver frets. Overall, the neck on this thing is comfortable and smooth to play on. This is was rather surprising seeing how you can often run into poor quality control issues even with models which are one category higher than this one. The question of build quality in relation to extremely affordable ukuleles is an interesting one. If you take the price into consideration, you can’t really expect too much precision craftsmanship. On the other hand, the instrument still needs to meet certain requirements. In the case of Diamond Head DU-150, the situation is pretty decent. While the ukulele is completely devoid of any complicated details, the entire thing is put together pretty well. You won’t find anything loose or put together sloppy. For what it is, DU-150 is a pretty solid ukulele. One explanation for this seemingly counter-intuitive situation is that Diamond Head simplified most of the components to a point where manufacturing errors are less likely to happen. The only real issue you should be aware of is the state of the action and intonation. This is something even the larger, top ukulele brands mess up from time to time. Fortunately for us, you can very easily fix this on your own, or by getting an experienced luthier to do the job for you. As always, the latter option is the one we recommend for obvious reasons. Especially if you are new to ukuleles. The hardware on Diamond Head DU-150 is best described as minimal. When you are dealing with an instrument where the designers looked for any way to cut down production costs, the hardware is one of the first things to suffer. The bridge, as we have said before, is a hardwood piece that was painted to look like rosewood. You can probably figure out for yourself just how frugal Diamond Head’s approach to designing this uke was when they skipped on a small piece of rosewood. Again, totally expected. The saddle and nut follow a similar policy. Both of these parts are made of generic plastic that features enough hardness to sustain the tension of the strings. Looking at the headstock we can see a set of run of the mill tuning machines. Out of experience, they have proven to be relatively decent, however this might one of the first elements you would want to upgrade down the road. From a beginner’s point of view, they are more than acceptable. Intermediate players who have a developed sense of pitch and key might not be as satisfied. Finally, we have the strings. Diamond Head ships the DU-150 with a rather generic set of strings. Their quality is more or less decent, however your experience may vary depending on the exact DU-150 you get. There will be units shipped out with weaker strings and those which arrive with a set that will last you for a long time. The most obvious aspect of DU-150 that will undoubtedly reveal some shortcomings is its sound. That combination of all maple construction and cheap factory strings makes the DU-150 sound a bit dull. With that said, if you decide to go out and swap the strings for something better, you will get a significant improvement in performance across the range. In its original configuration, Diamond Head DU-150 offers the very core of a classic soprano sound. This uke doesn’t have a refined color to it, nor was it designed to. For an absolute beginner, it will sound more than alright. Doing a pros and cons section for a uke such as this one is particularly hard. That incredibly low price automatically defuses any criticism we want to throw on it. On that note, there are still some pretty well-defined benefits and drawbacks to this model. Let’s check them out real quick. Putting the pros and cons next to each other reveals a pretty expected outcome. Diamond Head DU-150 is chock full of compromises, but ones that work in your favor. When viewed in the context of its own price range, DU-150 is about as good as it gets. In all honesty, you don’t really get to choose a lot for this type of money. When it comes down to extremely affordable beginner ukuleles, we just have to be realistic. Those who are disappointed in DU-150 are most likely those who had unrealistic expectations. The DU-150 is a very good ukulele for beginners. Everyone else immediately recognized the sheer value of this model. Especially considering that most of the other ukes in this price range come in form of toys or toy-like instruments. From a beginner’s point of view, DU-150 is a great, low-risk choice. Even if you decided that ukulele is simply not something you are all that interested in, you won’t beat yourself too much considering that you probably spend the same amount of money on a night out with your friends. In its own context, Diamond Head DU-150 is a quality bargain and that is something that is hardly going to be disputed. If you were on the fence bout this uke, we wholeheartedly suggest that you and get yourself one.